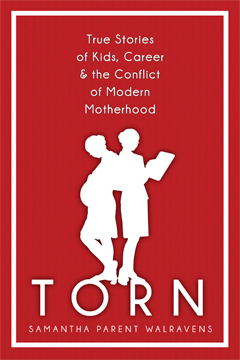 From television and radio appearances by editor Samantha Parent Walravens and her 47 contributors to interviews and major book-signing events, TORN: True Stories of Kids, Career & the Conflict of Modern Motherhood (ISBN: 978-1-60381-097-5, $18.95, 288 pp.) is creating quite a stir, and the momentum shows no sign of letting up. Newspapers such as the New York Times and the Los Angeles Times have enthusiastically endorsed the book, as have online blogs, review sites, and regional newspapers nationwide. On June 14th, editor Walravens spoke at the Big City Moms event in New York City and continues to jet around the country offering solace and hope for exhausted working and stay-at-home moms everywhere.